I was hankering some big, chewy molasses cookies the other night. 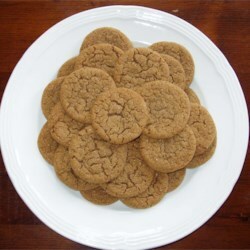 In about 30 minutes, I had 2 dozen ginger-colored delights popping out of the oven and into my mouth. Just perfect with all the holiday blends of coffee and tea out right now, or even a glass of milk. I wanted to share this super quick and easy recipe for ginger molasses cookies. This is the original recipe that I adapted it from. Again (as with many of the recipes I do for baking), I didn’t have any all-purpose flour in the cupboard, so I substituted whole wheat flour. The only other substitution I made was using real butter instead of margarine. We only had Smart Balance in the fridge and I haven’t tested out baking with it and I really didn’t want to try. Photo caption (above): One of the few photos that I could find on the page from the original recipe that resembled my finished cookie. They have a great color, a cracking top and glisten of granulated sugar. The whole wheat version that I’ve created may even be slightly darker than this representation. In a large bowl, cream together the butter and 1 cup sugar until light and fluffy. Beat in the egg, then stir in the water and molasses. Gradually stir in the dry ingredients into the molasses mixture. Shape dough into golf balls. Roll them in the remaining sugar. Place the cookies 2 inches apart onto an ungreased cookie sheet. Flatten slightly with your hand. Bake for 8 to 10 minutes. The cookies will be soft and not fully set when you remove from the oven. Allow cookies to cool on baking sheet for 5 minutes. Remove to a wire rack to cool completely. Store in an airtight container. These store perfectly in Ziploc-like plastic containers. They remain chewy yet slightly crisp around the edges. I also like that it has ginger in it, which is a great aid for digestion and other stomach issues, air or motion sickness, and just tastes yummy! This recipe would make the perfect holiday cookie swap treat or just a nice gift. Try mixing the dry ingredients together, placing in a container, wrapping nicely. Use scrapbook paper, ribbon and gel pen to write out the remaining directions for your gift recipient. Who wouldn’t like to bake some cookies this fall or winter? This entry was posted in Cuisine - American, Cuisine - Desserts, Recipes and tagged butter, chewy, Cookies, ginger, margarine, molasses, recipe, whole wheat by Christina. Bookmark the permalink. healthier and still delicious! i would recommend letting the dough sit in the fridge for about 10 mins. i found that made them thicker! !